Pastor Mark Arnold Opgrand was born and baptized in Medford, Oregon, and grew up in the Pacific Northwest. After graduating from high school in Beaverton, Oregon, he attended Pacific Lutheran University in Tacoma, Washington, graduating in 1970. Prior to seminary, he worked six summers and a winter at Holden Village, a Lutheran retreat center in Washington State. He graduated from Luther Seminary in St. Paul, Minnesota, in 1979. 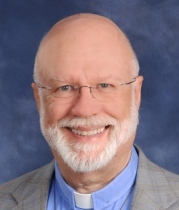 Pastor Mark served as a parish pastor in Caldwell, Texas, and worked as United Campus Minister in Odessa, Texas, before moving to Indiana, where he served as Lutheran Campus Pastor at Purdue University. Since 1997, he has been at St. Paul’s as Associate Pastor. After the death of his wife Carol Thysell in 2001, Mark married Rebecca Higgins in 2005. Rebecca is the Principal of Blair Elementary School at Porter’s Neck. Their family includes son Reed and daughter-in-law Sarah, grandchildren Savannah and Jackson, and daughter Celeste and son-in-law Chad, all of whom live in the Wilmington area. Pastor Mark and Rebecca share their home with “Possum,” a sweet terrier mix, and “Chessie,” an “in charge” Yorkie. Pastor Mark enjoys reading, preaching, studying, creating children’s sermons, pastoral care, working with Stephen Ministry, and playing in SPIRIT (St. Paul’s Intergenerational Rejoicing Instrumental Troupe). He also enjoys films, digital photography, technology, and all the latest gadgets.